Soccer lovers across Papua New Guinea are thrown into a state of confusion by the ongoing political infighting among the Papua New Guinea Football Association leaders. The Annual General Meeting held yesterday at Kimbe saw the long serving PNGFA president David Chung re-elected as president for yet another term by six member participants. 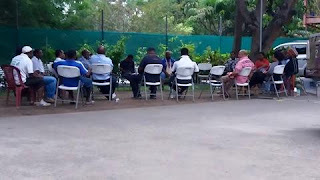 Hekari Chairman, John Kapi Nato and his camp of suspended PNGFA members were not too happy about the results of the AGM and are questioning the legality of the quorum. Mr Nato who was one of the nominees for the presidency seat said he along with the suspended members were not given airline tickets to attend the AGM. He said invitation was served firstly and then suspension given again so they couldn’t make it there. “For me I’ve been too soft, I see that the way Mr. Chung is taking this forward, I have no other choice but go to court."